GREENSBORO, N.C. (Aug. 18, 2017) – The North Carolina A&T State University Student Government Association and Student University Activities Board has enlisted the help of some of the entertainment industry’s heavy hitters for the 2017 edition of the Greatest Homecoming on Earth. 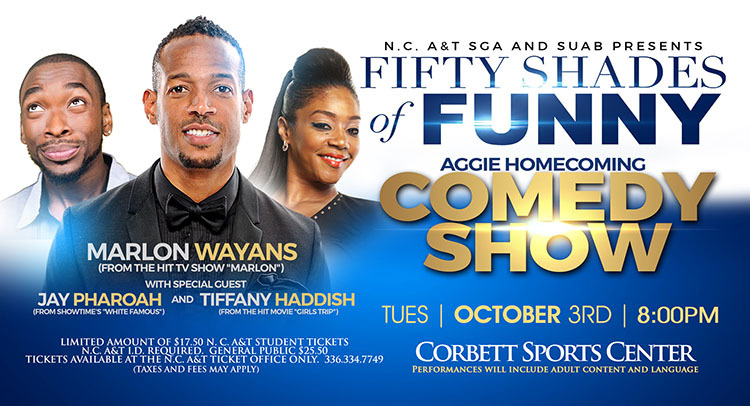 The comedy show, “Fifty Shades of Funny,” will feature headliner, Marlon Wayans, of “The Wayans Brothers,” “White Chicks,” the “Scary Movie” franchise and most recently Netflix’s “Naked.” Jay Pharoah of “Saturday Night Live” fame and breakout star, Tiffany Haddish, from “The Carmichael Show” and “Girl’s Trip,” will join him to fill out the show. Hip hop fans can look forward to “Slippery,” featuring Migos and Gucci Mane with special guests YFN Lucci and DJ Drama. Both the comedy and hip hop shows may contain adult content and language. The week-long event will wrap up with the Mann’s World Family tour fearing singer, Tamela Mann with her husband and comedian, David Mann. The gospel show will also feature a performance by the N.C. A&T Fellowship Gospel Choir. A full listing of student-centered homecoming events is listed below. Tickets for on-campus events and all student tickets are available at the Brown Hall ticket office. General public tickets for events at the Greensboro Coliseum are available via TicketMaster and the coliseum box office. 5-8 p.m., doors open at 4:30 p.m.